Really, it’s true folks! My Caesar is the BEST EVER! Don’t believe me? Well, here is my recipe – go, try it and I believe you’ll agree 🙂 I think the secret is the homemade croutons! Wash lettuce and tear into a large salad bowl, set aside. In a frying pan, melt butter and add minced garlic. Add bread cubes and fry on medium heat, turning often to brown/toast bread into croutons (this is best done slowly) Now you are ready to assemble your salad. In the bowl with the lettuce, pour the dressing, and mix well to coat. Add bacon and fresh grated cheese and toss. 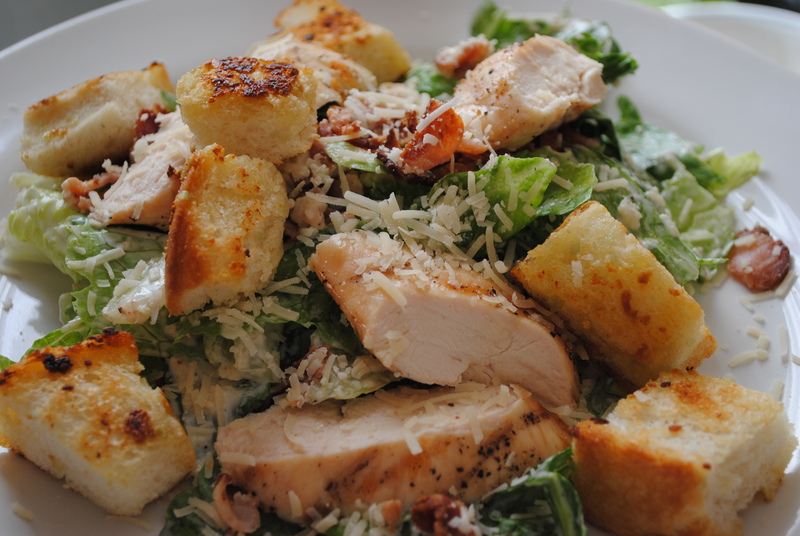 Arrange salad greens on plates, and top with chicken slices, extra bacon bits and Parmesan cheese. Sprinkle with fresh pepper and a dash of salt. Top with fresh croutons and add a squeeze of lemon. Serve at once. Yum!